1. Is that Jon Lovitz talking just off-camera, or someone doing an impression of him? Or are American talk shows generally populated by people who talk like Jon Lovitz? 2. So, this Letterman guy is a bit old. Like, Parkinson old. 3. His comedy is also old. Jonathan Ross would be ashamed of that mocked-up photoshop bit. 5. Isner looks actually really hot. 6. Isner does not have very good comic timing. 7. 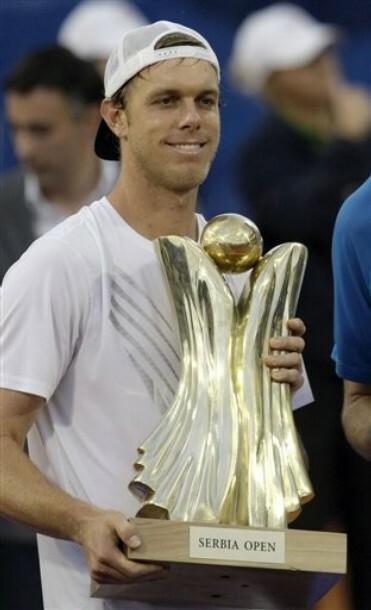 Isner looks hot, though. 8. Remember when Marat was on this show? 9. Did Delpo go on this show when he won the US Open? And if not, why not? At the opposite end of the emotional spectrum, John Isner also gave a pretty great press conference that’s worth a watch. Q. What kind of a night did you spend last night? Could you sleep? Nightmares? Or what? 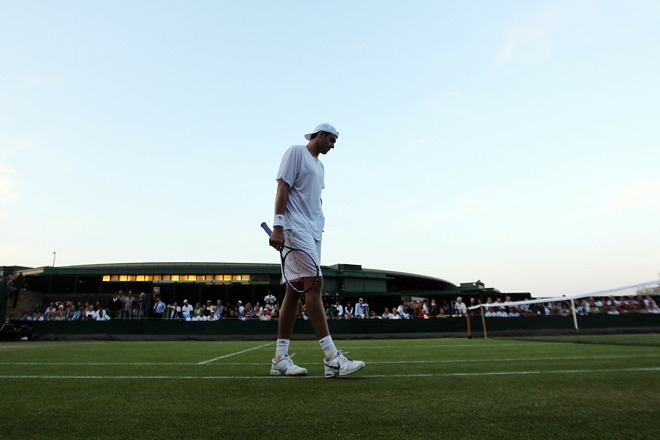 JOHN ISNER: I honestly, when I left the match, I really thought it was a dream. I didn’t think that type of match was possible. So I was really expecting to wake up, in all seriousness. No, I went back. I didn’t sleep great. I only slept for four hours. I talked to Nic. He said he only slept for about three. So we’re both kind of running on fumes right now. Q. The match had its own internal logic or rhythm. Sometimes it was a little crazy or surreal. Did you feel almost a different kind of space out there? Can you talk about your feelings as the match went on and on and on yesterday? JOHN ISNER: Yeah, I mean, yesterday I didn’t know what I was thinking out there, especially once the match got past, you know, 25 All. I wasn’t really thinking. I was just hitting a serve and trying to hit a forehand winner is the only thing I was doing. Fortunately that was going in on my service games. He was serving great and hopping around, you know, eight hours into the match, which was remarkable. But going out there today, I knew I had a feeling it wasn’t going to be anything like it was yesterday, although it did take, you know, 10 or so service games to finally get a break. I had a feeling it was going to be like that. It wasn’t going to last any more than 20, one way or the other. […] Q. Why do you think this match took so long? 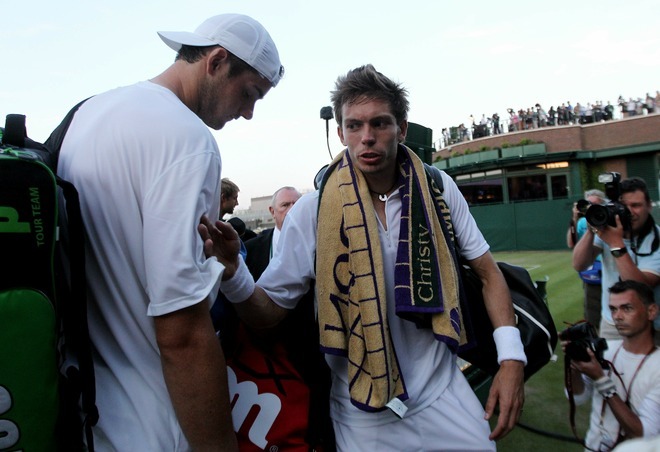 JOHN ISNER: I can’t explain that. Obviously both players were serving we both served really well. That’s the main thing. But even in that case, you can’t even imagine it going past 20 All. I don’t know. I guess it was just meant to be or whatever. You know, I mean, in a way I’m kind of glad it happened, although I am pretty tired. It’s pretty nice to be a part of that match. Q. Was there any point you were thinking, God, I wish they played a fifth set breaker here? JOHN ISNER: Yeah, without a doubt. 20 All yesterday I was thinking that. […] Q. 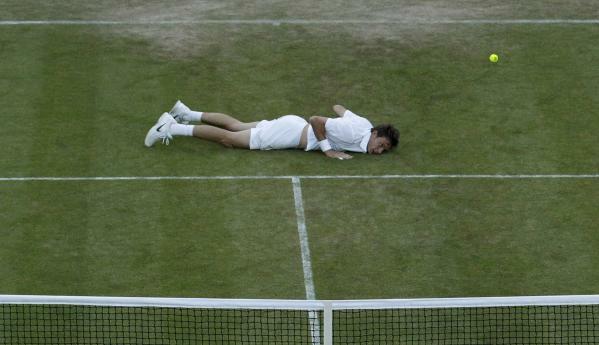 Now that it’s over, how does it feel to be part of tennis and sporting history? 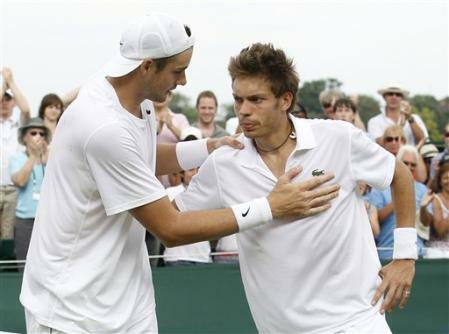 JOHN ISNER: Yeah, uhm, it’s great. I guess something Nic and I will share forever really. I don’t think I’ve ever said five words to the guy prior to our match. Not that he’s a bad guy. It is what it is. Now when I do see him in the locker room at other tournaments, we’ll always be able to share that. You know, like I said, I’m kind of glad it happened. Had I won in straight sets, I might be playing right now in my second round match. Q. 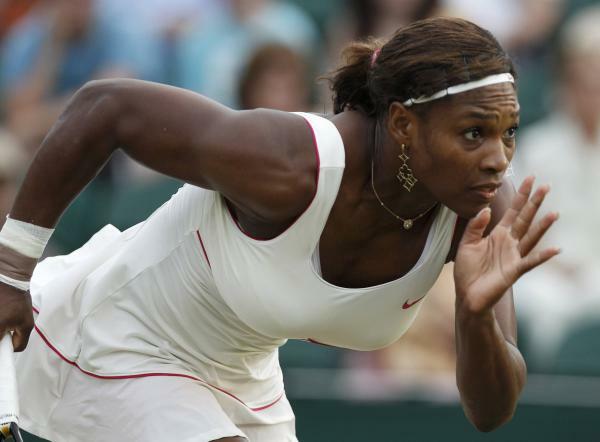 For tennis players, two of their biggest concerns are fitness and mental strength. Do you think you can be pretty confident in both departments after that match? 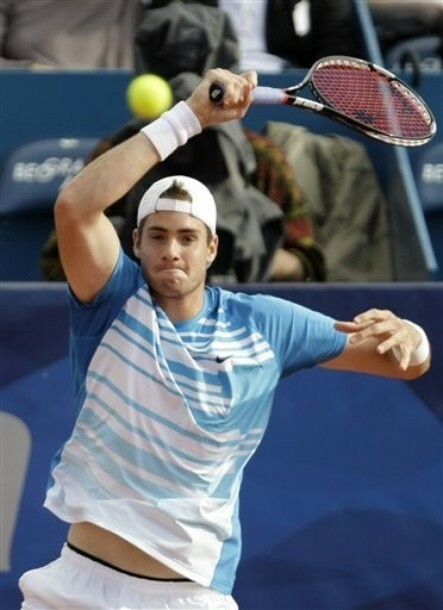 JOHN ISNER: Yes, I think so. I think especially mentally. Physically I have put in the work at Saddlebrook where I practice in Tampa, you know, with my trainers there. You know, I put in the long hours. Prior to coming to Wimbledon, I didn’t play in Eastbourne because I didn’t feel fit. I had the long clay court season. So I stayed an extra eight days in Tampa where it was a hundred degrees and a hundred percent humidity. I got in pretty good shape. My coach actually, believe it or not, said jokingly before the tournament started that I’ll be able to play 10 hours. That’s the truth. After practicing at Saddlebrook in Tampa in that heat, he was right. Q. Do you think the quality of the play will be remembered or do you think the match will be remembered just for its length? How do you think the quality was from start to finish? 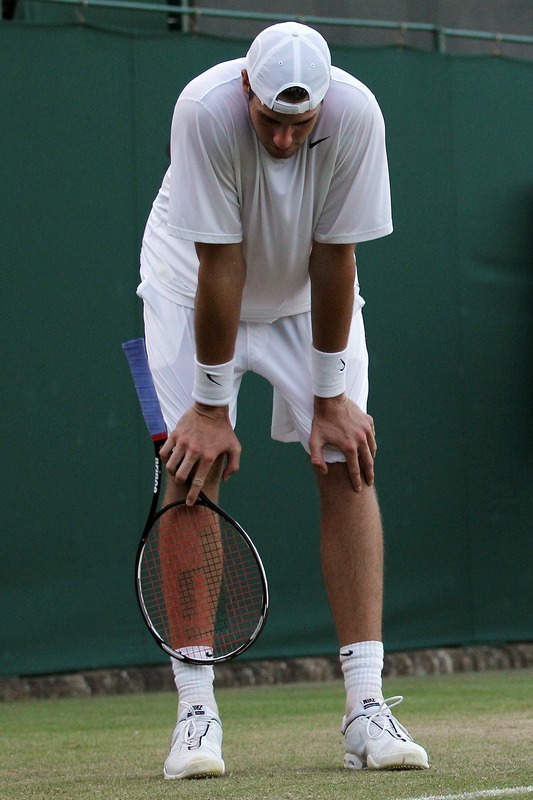 JOHN ISNER: Uhm, I think the quality was pretty good. I mean, you know, we both obviously just didn’t want to lose our serves. If you do, that’s the match. You know, towards the end, I want to say the last three hours of yesterday’s, whatever you can call it, we were both just hitting winners at will. I mean, I was so tired out there. Couldn’t focus. Didn’t know what I was going through. 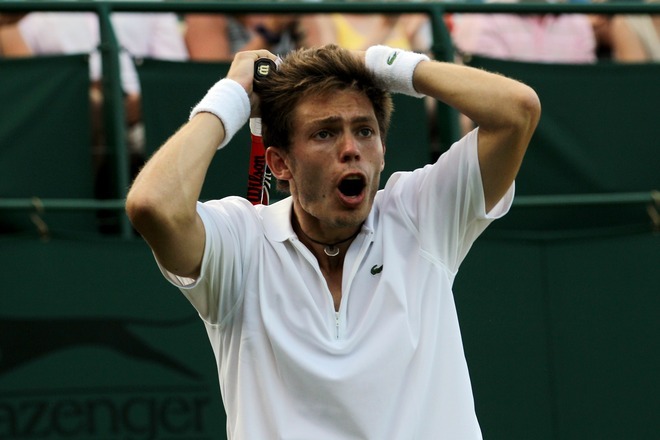 But I was slapping my forehand as hard as I could, and it kept on going in. The same goes for him. But I think it will probably be remembered for the distance. […] Q. Have you had responses from other players? 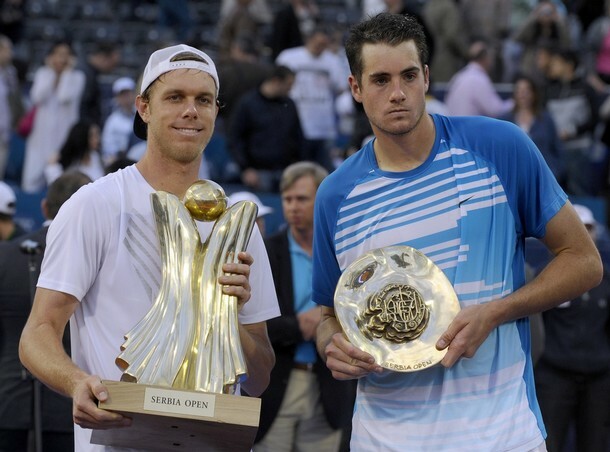 JOHN ISNER: Yeah. I mean, the guys that are in the locker room, pretty much every one of them came up to me and patted me on the back or shook my hand or whatnot. Q. How out of sorts were you by the end last night? 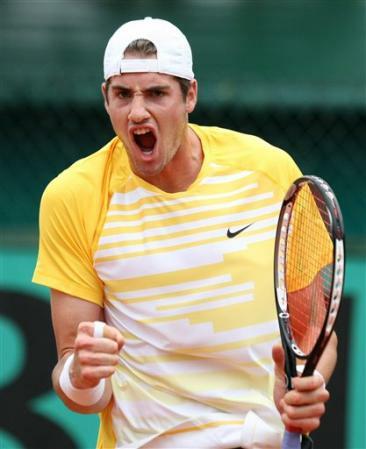 JOHN ISNER: Yeah, I was completely delirious. I mean, you know, I wanted to keep on playing yesterday, which I don’t know why, because he was the fresher one. But, you know, I said even though it was dark and no one could see, I wanted a final verdict, win or lose. I didn’t want to have to sleep on it. But it wasn’t to be. When I got in the locker room, sat down, just didn’t know what to think. Q. Talk us through what your post match routine was. What was the first thing you did? Ice bath? Eat? 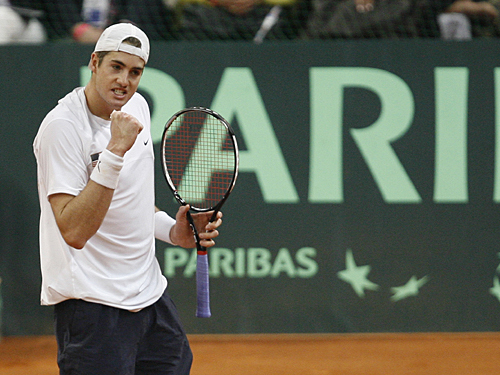 JOHN ISNER: I drank a recovery shake just to get some carbs in me right away. My coach came to the locker room with a plate of pasta and a plate of a bunch of stuff, meat, and I don’t know what it was. But I couldn’t eat that right away. A lot of times after a tennis match, you’re not hungry right away. Takes like 30, 45 minutes. Yeah, then I took an ice bath, iced my arm down. Then I ate as much as possible. Then actually Andy Roddick left the site and came back with takeout food for myself and my coach, believe it or not. Q. What time did you actually go to bed? JOHN ISNER: Probably like 12:30. And I woke up, you know, when the sun’s coming up at 4:00. Never seen that before (smiling). […] Q. In the finish, was it the will to win or fear of failure that got you across the line? 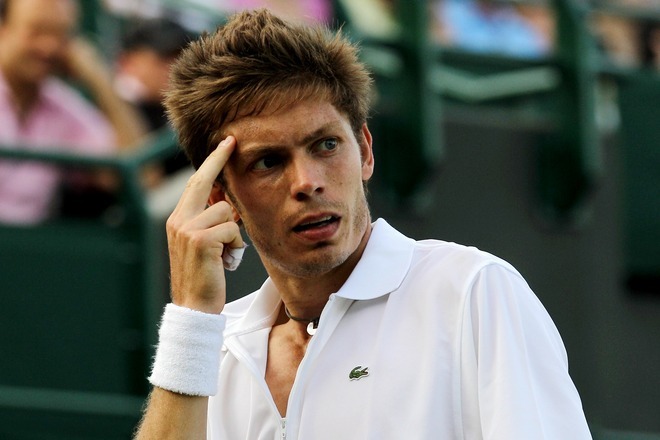 JOHN ISNER: Oh, that’s a good question. I think it was more so the will to win. Obviously in the back of my mind is, as I’m sure it was with him, I don’t want to be on the losing side of this. It’s going to be a little bit better to be on the winning side. But I think it was the will to win. Not that I outwilled him. I mean, obviously he gave it his all. I just kind of was a little bit more fortunate than he was. 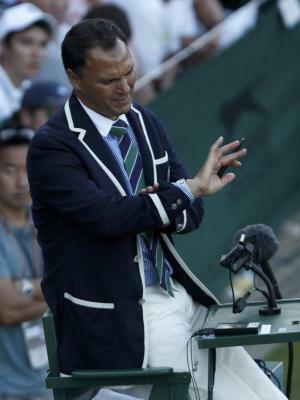 Mohamed Lahyani of Sweden spent 11 hours, 5 minutes over three days in the umpire’s chair before declaring victory for John Isner over Nicolas Mahut in their first-round match. The fifth-set score was 70-68. […] “When you are so focused, and every point feels like a match point, you just don’t even think about eating or needing the bathroom,” said Lahyani, who lives in Spain. 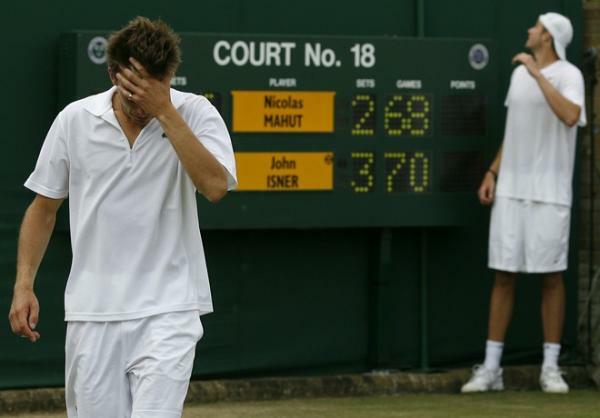 His comments were released in a statement by Wimbledon officials. 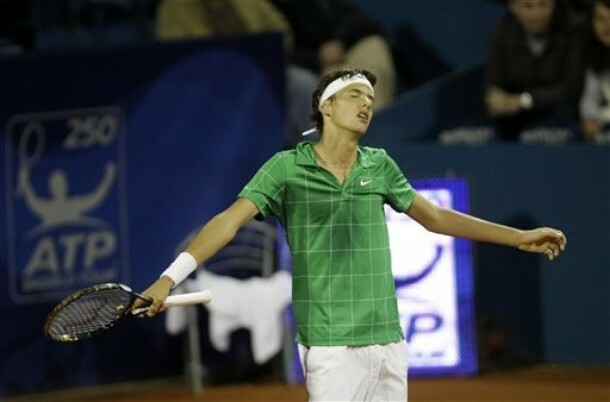 During the fifth set, the bulk of which was played Wednesday, Lahyani periodically massaged his neck or rolled it, folded his arms and stretched his legs out from the high chair after growing stiff from so much time on his perch. At one stage, his voice cracked, and he cleared his throat to the amusement of the fans. On Thursday, he acknowledged that his throat got dry, but said he had since drunk “plenty” and that he felt fine after the long stint a day earlier because he is accustomed to taking long airplane trips in economy class. “Seven hours sitting still on court is nothing,” said Lahyani, who praised the line judges and ball boys and girls for their perseverance. The longest match that he officiated previously lasted five and a half hours. 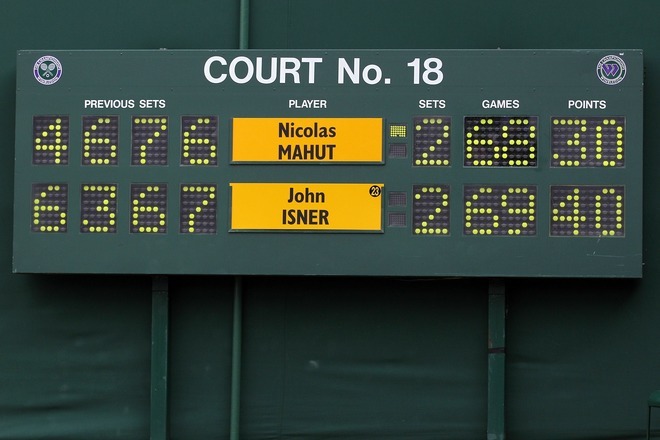 After a mere 11 hours and five minutes played, 183 games, 980 points, 215 aces, 490 winners, and 3 service breaks, John Isner defeated Nicolas Mahut 6-4, 3-6, 6-7, 7-6 and 70-68. I didn’t really approve of the somewhat forced presentation presided over by Inverdale after the match – nor of asking Mahut to address the crowd and pose for pictures when he was clearly and understandably devastated – but given that Isner gets a mere second round spot and Mahut a cheque for £11,000 or so, I suppose the occasion had to be marked in some fashion other than the dignified round of applause it deserved. Let’s be honest though, this match veered into surreal territory and out again several times over the past three days, and by the time it reached 20-all in the fifth or so nobody was really playing for that second round spot and certainly nobody was playing for the cheque. They were just playing to win; stubbornly, doggedly, to be the last man standing. And in the process I don’t think it’s going too far to say that they redefined people’s ideas of what tennis players, as physical specimens and competitors, are capable of doing. And by ‘ends’, I mean exactly the opposite. Let’s take a moment and deal with this. The longest match in history. The longest set in history. 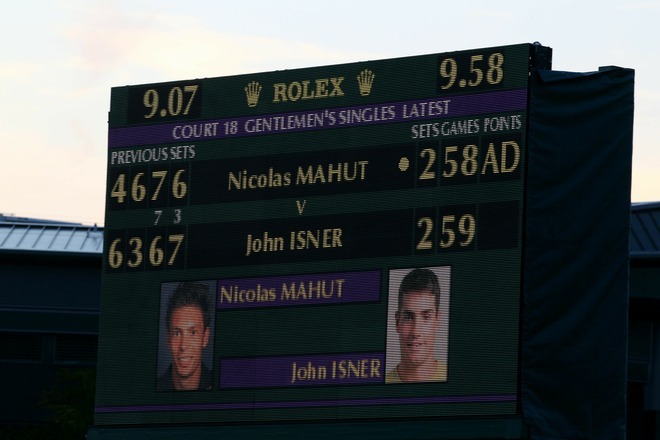 The most aces in a match in history (Isner), closely followed by Mahut. By my invariably faulty maths, 144 games without a break of serve. And it’s still not over. I will genuinely kill the next person to suggest a fifth-set tiebreak be introduced at Wimbledon. That is all. Except please, please read this. The most loveable zombies of all time. Blogging advisory: in a spectacular but unavoidable instance of bad timing, I’m going to be away for a few days and almost certainly won’t be able to post. 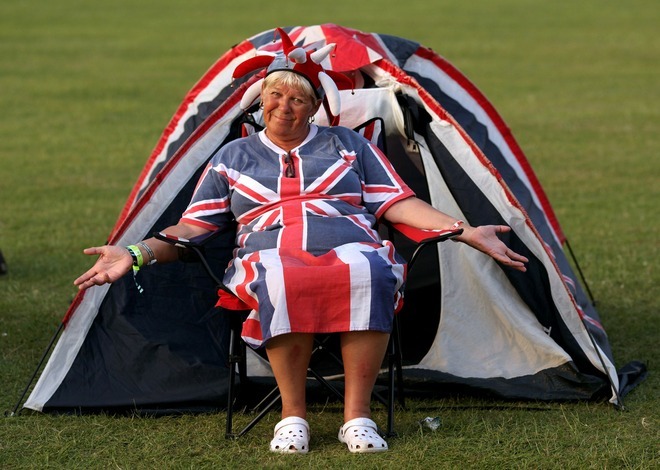 Sorry – I’ll be back Sunday night, by which time the tournament will not resemble anything like the one I left. Heigh ho. Go Mandy, Marin, Boss, Ferru and JJ! 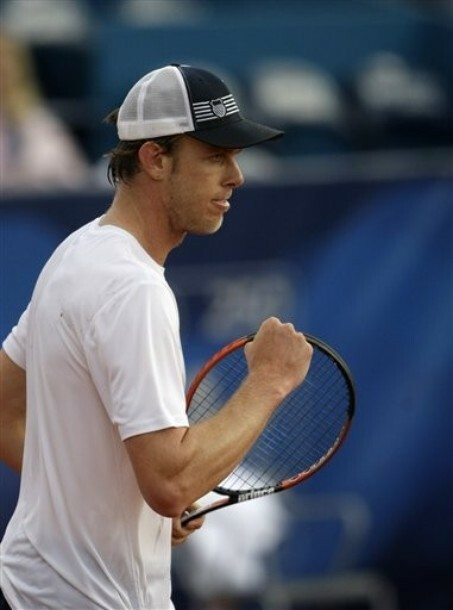 A tough day in Belgrade for the two tall drinks of unlikely tennis player as good buddies Sam Querrey and John Isner faced each other in a final for the second time this year – only to have it end much the same way. In Memphis, Isner was up a set and 5-2; today, he served for the match and even had match point at 63 54, only for an errant forehand and a subsequent failure to put it behind him to cost him the match. 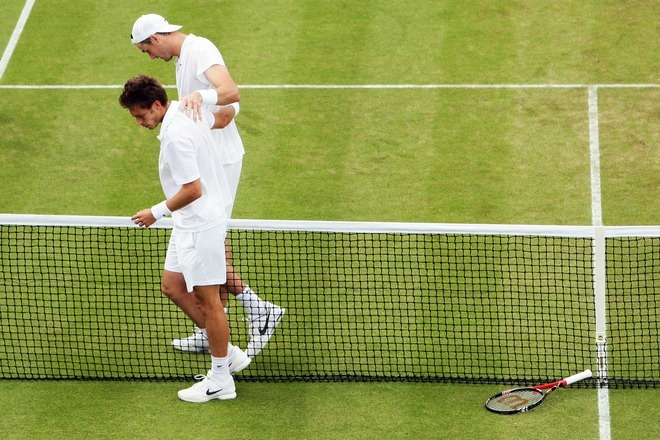 Does Isner have a buddy problem, or does he just have problems closing out matches? Answers on a postcard. 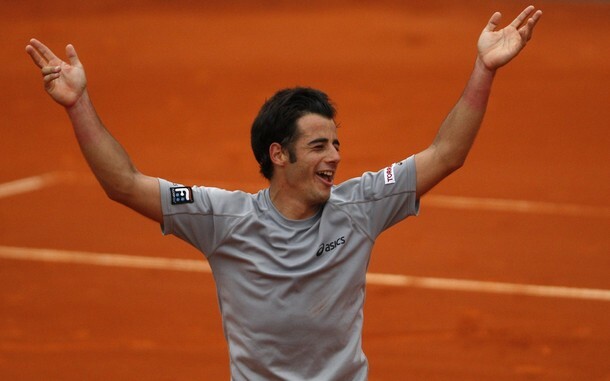 Anyway, from what I saw, Sam played better as the match went on and thoroughly deserved his title – which, incidentally, made him the first man to win a title on European clay since 2003. And while big John was clearly crushed, there’s no way this trophy presentation (with special guests!) won’t have cheered him up at least a little. It did me. 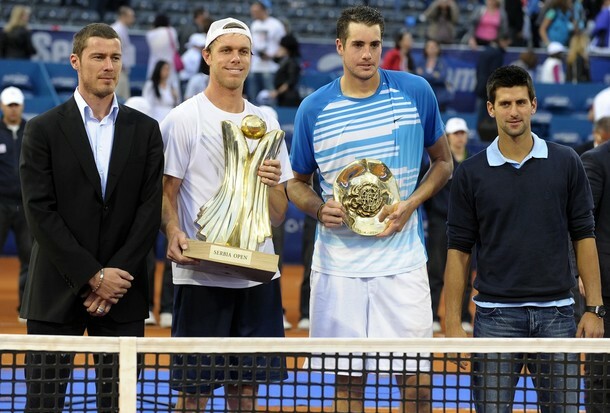 Who knew Nole was such a midget?! So here’s the state of play. Somewhat ironically, there’ll be an all-American final in Belgrade. 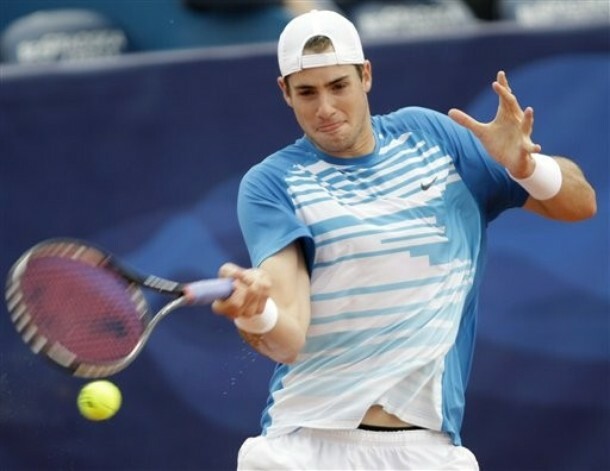 John Isner had a great win over Stanislas Wawrinka and Sam Querrey disposed of little Filip Krajinovic, in his first ATP semi-final courtesy of Novak Djokovic’s withdrawal. He lost 61 62 in front of his home crowd. Welcome to the wonderful world of the ATP! 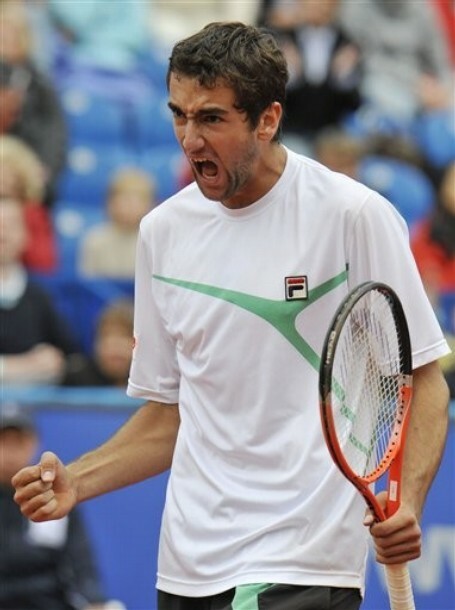 In Munich, Marin Cilic has somehow cobbled enough wins together to be in the final. Yes, it’s one of those weeks. He actually played really well against Marcos Baghdatis today and got better as the match went on, which is, I suppose, a good thing. 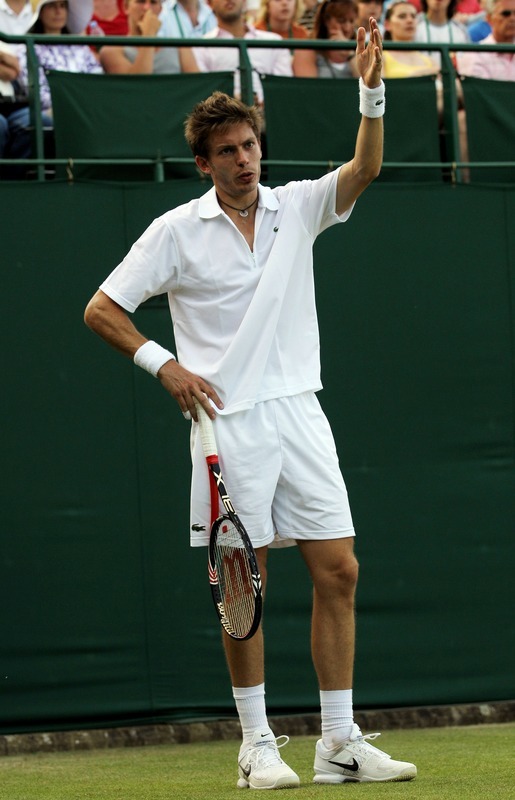 It’ll be Mikhail Youzhny facing him in the final, after Youzhny disposed of Philipp Petzchner who had knocked out the defending champion Tomas Berdych. 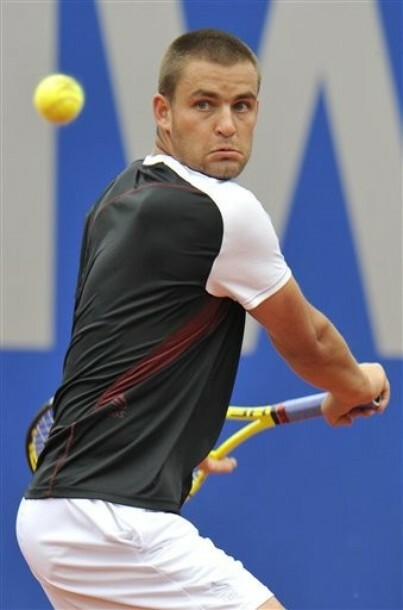 Youzhny is up 3 -0 in the head-to-head with Cilic, by the way. I’m just saying. And the shock of the day in Estoril was Roger Federer’s 62 76(5) loss to Albert Montanes, the defending champion, in Estoril. It was a rain-delayed day, the conditions were terrible and for whatever reason, Federer just didn’t adapt at all. It was a mystifyingly lame performance from him, although he insists he isn’t worried – his post-match comments basically added up to ‘meh, these things happen’. 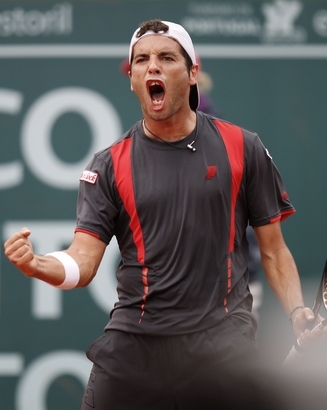 I was fairly impressed with Montanes, though, who didn’t let either the conditions or the unexpected lack of resistance throw him off and is now in an excellent position to defend his title. 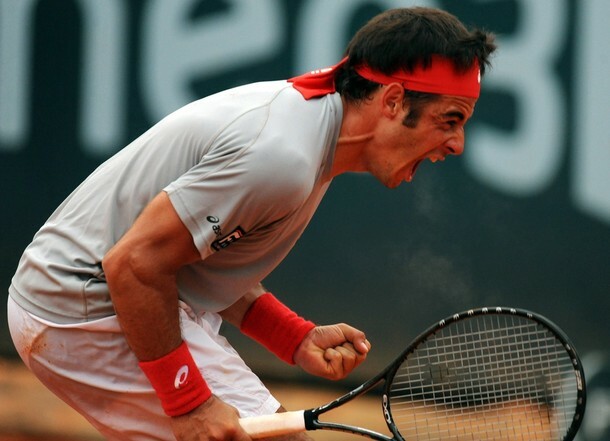 Lost in the Federer shuffle, however, has been the fact that Frederico Gil has become the first Portuguese player to reach an ATP final and he’s done it on his home ground, beating Guillermo Garcia-Lopez 62 57 63. Heartwarming stuff. Congratulations to Serbia, who have made it into the World Group quarterfinals for the first time in their history. And yes, a lot of this victory does belong to Novak Djokovic, who beat John Isner 64 in the fifth for his second singles point and to clinch the tie. I didn’t watch most of the match as my eyes were elsewhere (mainly on Team GB and Nalby). 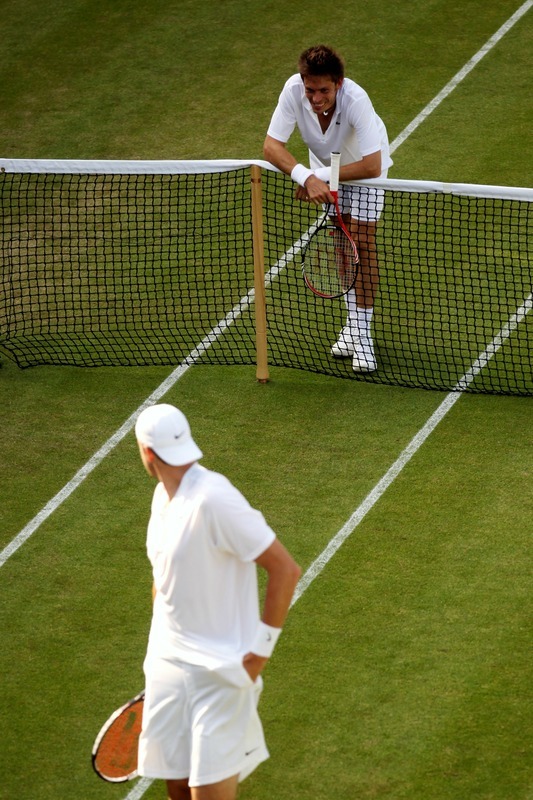 But from what I did see, John Isner was playing really impressive tennis – well, he took Nole to five sets on clay, come on – and proving himself as psychologically resilient as his predecessor in the no. 1 singles spot, Andy Roddick. 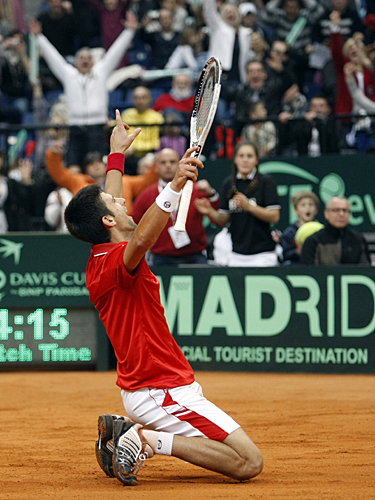 ‘Heart’ is an overused word, never more so than in Davis Cup, but there’s no denying the big man has it. A heartbreaking loss, but he should be really proud of how he comported himself this weekend. Nole, though. The bendy kitten-haired one once again carried his country and cried the good kind of tears this time. 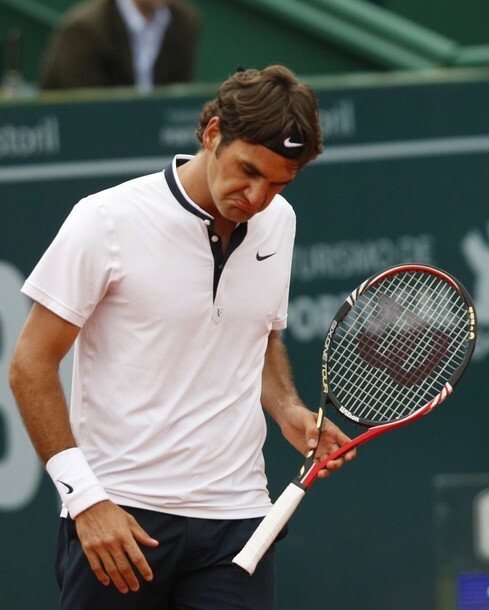 He wasn’t playing his best tennis, that’s for sure – where’s that gone, by the way? Anyone seen it? 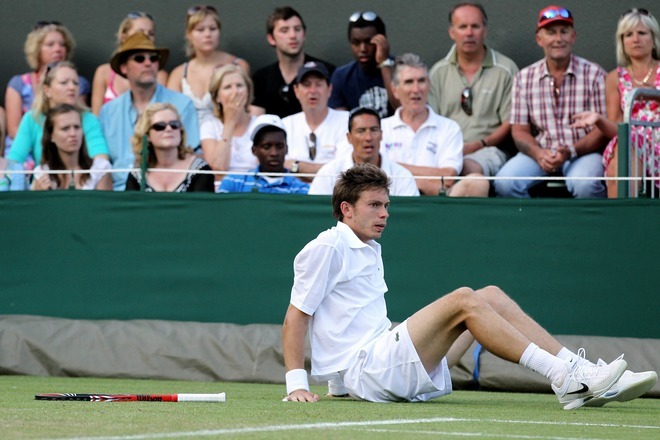 – but he found enough good tennis when it counted to carry him over the finish line against an opponent who was fighting for his life, and that’s what matters. Soft-haired, crazy-eyed hugs for all! Croatia next … that should be interesting.